You are here: Home » Starring a well known actor, or does it? It was another Friday night. That meant it was time to go around to a friend’s house and spend the next 5 or 6 hours in pain. Yep, It was Bad Movie Night. We saw two films, then following up with some bad twilight zone rip-off episodes. One was called “Snow Sharks“, yep more than one! The other, well that’s what this post will be about. 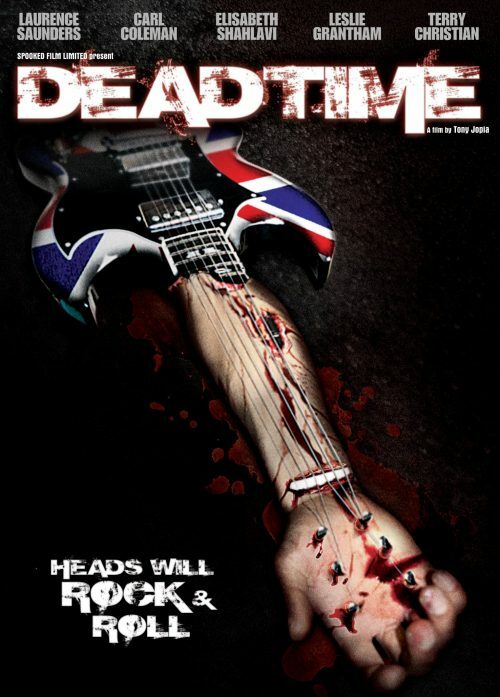 The film, DeadTime, had Terry Christian (host of The Word) and Leslie Grantham (Dirty Den from East Enders). Well, they were top billed. Both actually appear in the film for not much more than 10 minutes. A bit of false advertising? They were the only people who you could recognise. Their performance seemed to be finished after a couple of hours on set then they went back to doing whatever they currently do. The film was actually quite good. In its way. The acting was dreadful. Sometimes it did feel that they were just regurgitating the lines from the script without worrying about anything else. At least the corpses didn’t noticeably breath. We have seem many a breathing corpse before now. Sometimes they do look like they are trying hard not to giggle. It was a slasher-by-numbers but with a slightly different premise. A band on a crash dive to oblivion after their problematic second album are given one last chance to get their “spark back”. Locked into a recording studio over a weekend that doesn’t have a phone or a, as all modern horror films have to have, mobile signal. What could possibly go wrong? Quite a lot actually. A psychotic murderer is on the prowl. Armed with a large knife, mask and an evil glint in his eye. The deaths are well done. Some are turned a bit comical with the addition of some visual effects. Ones that could have worked better practically. The addition of the named “stars” was pointless as all they did was explain some of the back story of the band and send them off onto their great quest of regaining their stardom. It could have been played by anyone. Better actors would have been a start. In a way the selection was good as it did pique my interest.